Everything has a purpose. So is this write up! This is going to talk about an ever optimistic lady and how she takes on her little bit withered, lost-hope kind of a brother… And finally something that would move your heart! He interrupted, ‘Is this all life about? Given a choice and looking at how this world is operating, how animals suffer in the hands of unscrupulous humans, how underprivileged kids are deprived of basic education, how most rural women endure life with their indifferent, born-to-drink husbands, would you not wish the world to come to an end! ?’ I could understand the depth and pain in his words. Does that mean I could let him go off the hook? I have HOPE I could change the world! Now that’s tall, isn’t it? I know I am not done! I am running for a cause. I am running to educate rural Tamilnadu. I am participating in Chennai marathon, running for Isha Vidhya. I made a commitment, rather a promise that I would reach out to as many people as possible. Dear friend, I need your support. Of course, I didn’t make this promise without you in my mind. Everyone has the willingness to help. But the means, genuineness of the cause [does my hard-earned money really reach the poor and the needy?] are deterrents. But here you know how your contribution is being spent. Isha Vidhya need monetary support to construct class rooms, toilets, hire teachers, to provide food, school buses, book, uniforms, needless to say for everything. When this initiative was started in Cuddalore in the Tsunami affected regions, no family was willing to send their children to school. They thought it was a farce that Isha Vidhya would provide education free of cost. The children initially came without basic hygiene. Those committed teachers there even brushed their teeth, combed their hair, provided them snacks out of little money they had, before they went on with ‘A B C Ds’. Now in all 9 IV rural matriculation schools, meals are being provided! Before I close this article, let me talk about a small boy whose education was sponsored by someone like me in Isha Vidhya, Tuticorn village. A 3rd grade little bud was questioned, ‘What would you want to become in the future?’ for which came a stunning reply ‘I want to become a very rich man, earn lot of money.' Hmm... That's not OK the questioner thought and proceeded to know why, pat came the reply, 'I want to sponsor FOUR kids like me!’ His eyes sparkled as he said this... Should I continue to talk on the impact?! It may leave a small hole in your pocket, but be rest assured it would fill your heart with love and purpose! 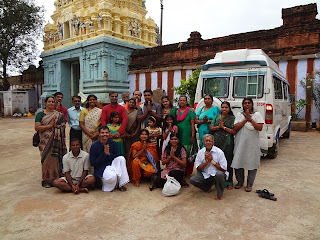 Though the initial plan was visiting Sangameshwara temple, in Kadapa, (thanks to Swami Gurubiksha) we “corrected” our plan to visit Someshwara as well. After a bit of waiting and eating (:D), we started from Chennai at around 9 am, 26, Oct 2013. An easy 6.5 hours of journey was stretched to nine hours (Thanks to all of us – we stopped at every possible place and I enjoyed every bit of it!). We reached Devuni Kadapa, Someshwara temple at around 6. With a tiring body and mind, I got down, more than the temple entrance, I was looking for ‘Idli podi’ shop(Well, that’s typical of me. I was entrusted with the job of getting Idli podi for dinner). Finally, I delegated the job to the driver anna and prepared to get into the temple. To my slight disappointment, the Linga, Someshwara was so small, but beautifully decorated by the Naga Abharnna. We did archchana in all of our names, prostrated to the Linga there and proceeded to the parikrama. At the back side of the temple, there was a thinnai where some other deities were present. I found a pillar and resting my back there, sat in silence, eyes closed. I was gracefully intimidated by the divine mosquitoes there, I got up (out of no choice) to darshan the other deities and finally did ‘Guru pooja’ in front of Shiva in deity form and came out of the temple. My mind wasn’t so alert or sharp to comprehend what happened inside the temple. But the moment, I stepped out of the temple, I felt I was a different person. There was no tiredness anymore. Mind and body became fresh as if I jus did my practices or Sannidhi or Bhairavi pooja. We all boarded our vehicles again. The purpose of our trip was over. Visiting Sangameshwara temple was an addendum, I thought. Little did I realize, the yatra was far from over. Now everybody was charged up. The chants were on continuously. Guru Paduka Stotram, Nirvana Shatakam, Aum Namashivayah, Brahmaananda Swaroopa, Shambho were chanted in full swing. We reached Sangameshwara temple near the river bed in the midst of mountain range at around 9 PM. The prohitar narrated the history of the temple, the importance of pancha abhishekham in pure telugu (thanks to Raj, he did the rendition in tamil). There were some amazing facts about the temple shared by the priest there. My logical mind could get a bit, but was not focused so much. Probably, because I heard them as a fascinating story not as true happening. The entire process got over around 1’o clock in the night. We had our dinner and rested for the day at around 2 am. I went to sleep with a piercing headache. I woke up around 8 am the next morning (btw, I was the last to get up J) with the same headache. The pain was nagging and persistent. There was a flowing river near by. Everybody took a dip, bathed there. I was the last one to go alone. There was an eerie silence, jus the sound of flowing river. I went with bare foot, stepped on some thorns and rocks. I had walked some 7 or 8 steps towards the stream and started to feel the depth. I was standing in water till my waist. I tried to sit on a rock to get a grip and do a ceremonious three dips in the river. Gushing waters inside was pushing me up. I felt strong under water currents. First time, I felt a fear for life. Unyielding part in me didn’t want to recede without taking the dips. Finally, with great grit, completed the dips, went back to the stay area, changed clothes and went inside the temple for a darshan. This temple has something… it is not a modern complex as we see in our cities. It needs to be experienced! Somehow, the sanctity of this place, the energy is well preserved over several hundred years.